Electronic Integration is a Denver, Colorado firm specializing in the creation of custom engineered Home Theater systems and Whole House Entertainment. Complete free-standing single-use home theaters are also an Electronic Integration specialty, with dynamic sound, dazzling large-screen displays and even seating that moves with the action. We invite you to browser our collection of world-class home theater and technology installations. Electronic Integration is a Denver, Colorado firm specializing in the creation of custom engineered Home Theater systems and Whole House Entertainment. 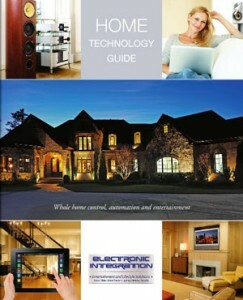 Explore how home theaters, integrated home technology, entertainment, audio and automation enhance your home and lifestyle. With the right planning, investing in a home theater can be one of the best enhancements to your lifestyle. Home theaters are great for relaxing, entertaining, and bringing the whole family together. • Custom Security Solutions • Whole House Music • Lighting Control and Shade Systems • Networking and Computer Systems • On-Site Service • Free In-Home Consultations Available!